Michael Nevins, M.D., practiced internal medicine and cardiology in Bergen County for more than four decades until he retired and moved to Piermont five years ago. His article "Cholera Comes to Piermont" appeared in South of the Mountains, January-March 2016. Information about his published books on medical history can be found at michaelnevinsmd.com. A sketch of the life of the Spring Valley physician called the unofficial "medical dean of Rockland County." Your editor interviews a longtime employee on site at the Blauvelt House. In case you missed it, Executive Director Susan Curry Deeks takes us on the October tour in Haverstraw, celebrating 400 years of the village's history. Your consulting editor gets our readers up to date on the Historical Society getting up to date. COVER PICTURE. 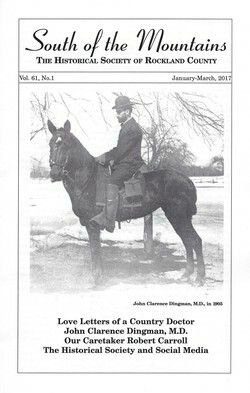 John Clarence Dingman, M.D., on his horse, Maggie. The photograph was taken in Viola by Fred E. Crum in 1905. From the Collections of the Historical Society of Rockland County.